The product's three inventors will share a $1 million prize. Last month, Intel the tried to make inventors cool. 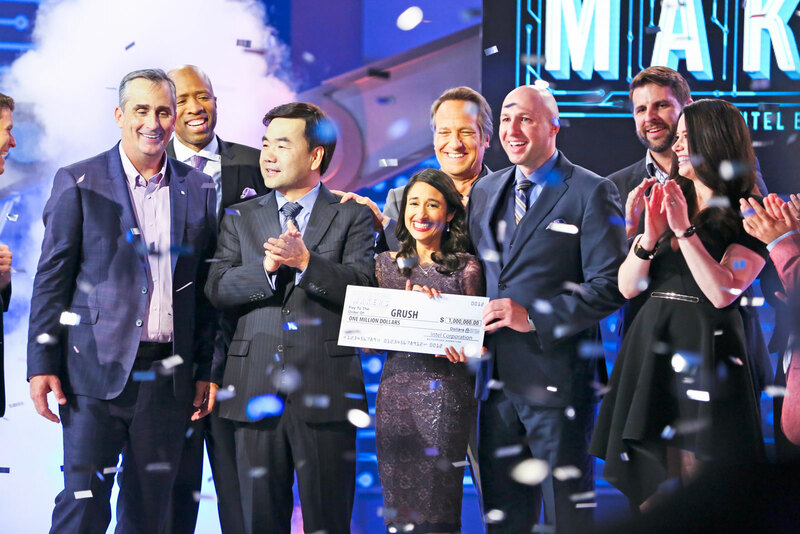 The company brought tinkering into prime time with the debut of America's Greatest Makers, a reality TV competition on TBS where 24 teams of inventors have been competing for a $1 million prize. Intel's involvement means two things. For starters, CEO Brian Krzanich is one of the main panelists. Also, to even qualify for the competition, all of these projects had to incorporate Intel's button-sized Curie module, which was designed to power the coming wave of connected objects. Seven weeks later, those 24 teams have been whittled down to five, with the season drawing to a close tonight. The winner is Grush, a three-person team whose smart toothbrush works with a mobile game to help children brush their teeth more thoroughly than they would otherwise. It's the sort of product that would be right at home at Intel's futuristic CES booth. Grush's smart toothbrush isn't entirely a novel idea: we've seen smart utensils like this vibrating fork, while toothbrush giant Oral-B has been making Bluetooth brushes for years. But Grush is interesting not just on account of how it worked, but who it was for. Using built-in sensors, the toothbrush can tell how you're holding it, and therefore what areas of your mouth you may or may not be reaching. Using the Curie module's on-board Bluetooth radio, the brush then sends that data to a companion app, which turns the whole act of brushing into a game: you don't "win" unless you hit every tough-to-reach spot in your mouth. The product is the brainchild of pediatric dentist Anubha Sacheti, futurist Ethan Schur and inventor Yongjing Wang, whose PhD in physics makes him the most engineering-literate of the three. As parents (and in Sacheti's case, dentists), they began with the problem that many people have bad teeth, and that folks tend to learn bad habits early on -- not least because kids don't like brushing their teeth to begin with. Team Grush actually filmed the season finale back in March, which means they've been keeping their victory a secret for around two months now. The first order of business: celebrating. But "we need to jump from celebration mode back to makers mode," Schnur says. Next up, the company needs to actually put out a product, or at least get one ready for public demos. In fact, the next time we hear from Grush might well be at CES, where the team hopes to join CEO Brian Krzanich on the stage during his annual Las Vegas keynote. If all goes according to plan, we'll be getting hands-on with the toothbrush then. You know, unless a Curie-powered "adrenaline dress" proves too distracting. Dana is the Editor-in-Chief of Engadget, where she runs a growing team of reporters and reviewers. She got her start in tech journalism a decade ago as a writer for Laptop Mag and the AP before arriving at Engadget in 2011. She appears regularly on ABC Radio and has also been a guest on Bloomberg TV, CNN, CNBC, Marketplace, NPR and Fox Business, among other outlets. Dana is a graduate of Wesleyan University and the Columbia Publishing Course. She lives in Brooklyn, New York.